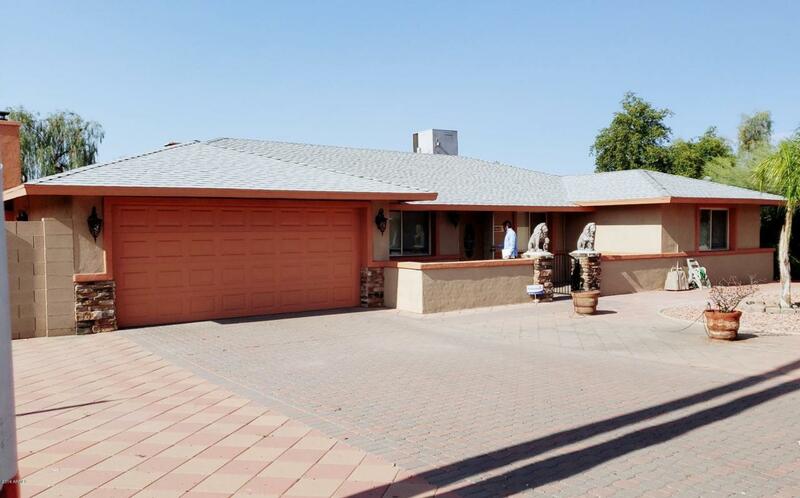 BEAUTIFUL REMODELED HOME IN/OUT IN THE GREAT PARADISE VALLEY SCHOOL DISTRICT. FEATURES 4BEDS, 2BATHS, 2CAR-GARAGE ON AN OVER 10,000 SQUARE FEET LOT. UPGRADED KITCHEN GRANITE COUNTER TOP WITH A LARGE ISLAND WITH PEDANT LIGHT, AND STAINLESS STEEL APPLIANCES. COZY FAMILY ROOM WITH ELECTRIC FIREPLACE, HARDWOOD AND TILES FLOORING ON THE RIGHT PLACE, NEW LAMINATE WOOD IN ALL BEDROOMS. CEILING HAS WOOD MOLDING AND WOOD TRIM AROUND ALL DOORS. DUAL PANEL/LOW E WINDOWS, FULL COVER PATIO, SEPARATED LAUNDRY ROOM WITH NEW CABINETS, WATER SOFTENER, SMOOTH COAST STUCCO EXTERIOR, PAVER THROUGH OUT BACKYARD WITH RV GATE/PARKING...TOO MANY TO LIST... MUST SEE IT TODAY! Cross Street Hwy 51 & Shea Blvd.